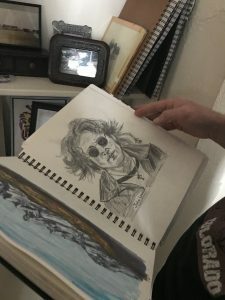 GEORGETOWN, Colo.– Thad Kosse, 47, of Georgetown, slowly circles the table smoking a cigarette waiting for someone to ask about the art, his art. His short, tussled hair frames the kindness and wisdom in his eyes. Passers-by glance from a distance, reluctant to come close to the lone vendor assembled in the town square. “I stopped drinking almost two years ago, so then I got bored and just started drawing again,” Kosse says. After four years of art classes in high school followed by two years of graphic art classes he traded the paper and brushes for booze, then spent the next two decades in bars drinking nightly. Alcohol controlled his life and his choices. Last Christmas his mom challenged him to draw her favorite rock stars’ faces. Rock stars of his mother’s generation like Jimmy Hendrix, Jim Morrison, Janis Joplin, Johnny Cash, Bob Marley, even Marilyn Monroe. He accepted. Those original pieces now hang in the hallway of his 1890’s home, once miner’s barracks, as homage to the shift of leading a sober life. “I love my magnet of the wolf in greens and purples. His work is inspiring,” says Patty Van Horn, one of Kosse’s recent customers. 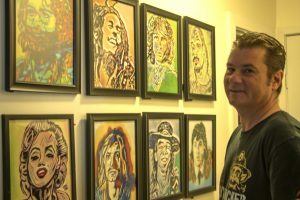 Kosse’s customers at the Idaho Springs restaurant where he works want to buy more and more of his art. 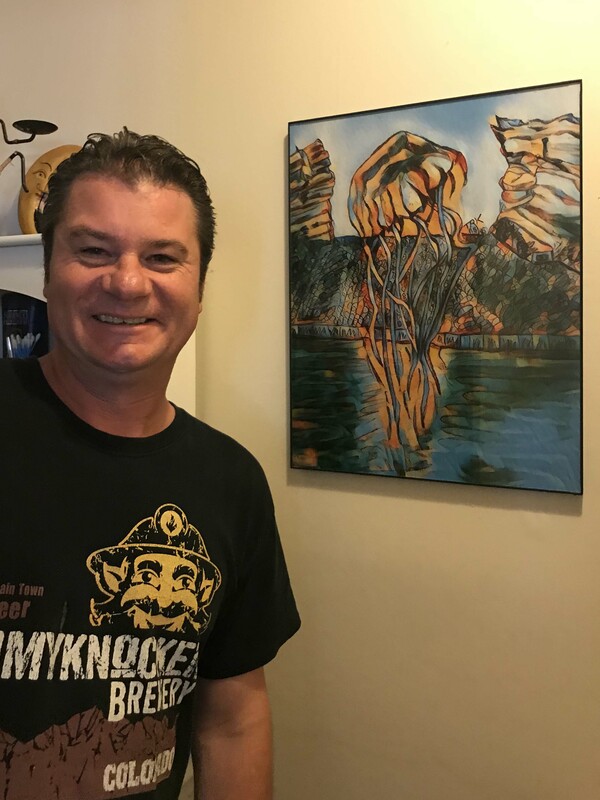 The amount of interest he receives has encouraged him to branch out from drawing only the faces of rock stars to Colorado animals and historic streetscapes. If you’re traveling Colorado’s high country, you may see Thad and his partner, Debbie Fesler, cruising the streets of Georgetown on their days off in their traveling sales office, a golf cart adorned with magnets. “Have you seen these yet? Original, local art for only $5.00!”, she says as she hands them a magnet for inspection. “This is how we purchased the golf cart! With the money made selling Thad’s magnets from the golf cart,” Fesler added as Kosse nods with a childlike grin. Look for more from Colorado native, Thad Kosse in his new life of sobriety. He is finding his business legs and hopes to travel to festivals selling his art full time soon.